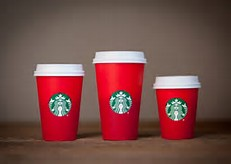 The more extreme right side of Christianity has drawn attention to a certain red cup. Now the media is being blamed for this supposed war because…wait for it….they reported on it. Even The Donald has gotten in on the action. When he’s president everyone will say “Merry Christmas!”. I’m not sure how he’s going to accomplish that, but okay. A number of my Christian friends have seen through the red cup controversy. They see how silly it is. They see what a caricature it makes them out to be. The arguments are endless about it, still, with some saying it’s not just about the cup. It’s that it’s just one more way that the left is winning. It’s one more way that their freedoms are being eroded. Since when can we not say, “Merry Christmas?” I do not know one.single.person. 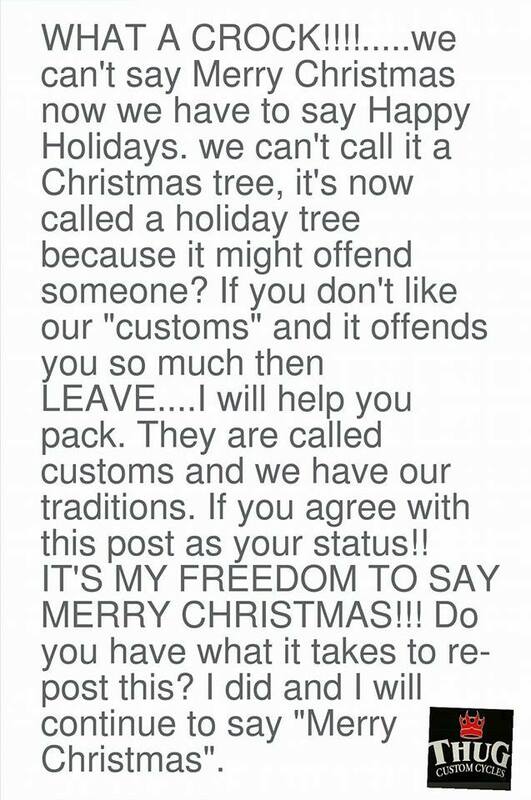 who calls a Christmas tree a holiday tree. What a crock, indeed. If it did offend me, though, where would I go? I’m American, too, afterall. There are times like this, however, when I’d really rather whisper that than say it out loud because this is just embarrassing. I’m not a Christian. I do celebrate Christmas. I put up a Christmas tree. Not a holiday tree, a Christmas tree. When I greet people at Christmastime I say, “Merry Christmas!” When it’s New Year’s I say, “Happy New Year’s!” Sometimes, when it’s someone I know I won’t see in between Christmas and New Year’s I say, “Happy Holidays!” Because, well, there’s a lot of holiday packed in a short period of time and they are holidays, for crying out loud. Do you know what has never, ever, ever happened? I have never been corrected on any of that. I’ve never been told I shouldn’t or couldn’t say, “Merry Christmas!” I’ve never heard anybody say that it shouldn’t be said. I understand why stores celebrate with “Happy Holidays!” It’s not a war on Christmas. It’s not eroding anyone’s freedom to say it, either. Or celebrate it, for that matter. It’s because this is a diverse society with any number of Jewish, Muslim, and Christians celebrating various holidays at the same time of year. Who doesn’t understand that? If you want to manufacture malice you really need to do it about something else. You’re making yourselves look like a bunch of narcissists who think the only holidays that should be important to everyone else are yours. Categories: Uncategorized | Tags: Christmas, Christmas Tree, Freedom, Happy Holidays, Holidays, Holliday Tree, Merry Christmas, War on Christmas | Permalink.